Cass Business School named as Education Partner for the race. Cass Business School is pleased to be the Education Partner for the Bloomberg Square Mile Relay taking place in London. Cass has also entered a team of 10 runners who will be racing through the heart of the City of London. 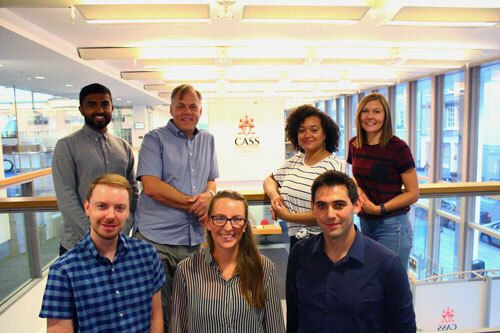 The running team will be captained by Dr Nick Motson, Associate Dean of MSc Programmes at Cass Business School. Nick is a seasoned athlete, having competed in two Marathon Des Sables – the equivalent of six consecutive marathons through the Sahara. The Bloomberg Square Mile Relay – now in its 12th year – is a one-of-a-kind, immersive team building experience, which takes place in the heart of London’s financial district. The race features a unique one-mile route through the heart of the Square Mile. Each corporate team has 10 runners, all of whom run the stunning one-mile course in relay style, starting and finishing from the Race Village in Guildhall Yard. The top three fastest teams, the fastest individual and fastest mixed team all receive a coveted race trophy. Unlike other corporate events where individuals compete against one another, this event is all about the team.